Ring-necked Pheasants stride across open fields and weedy roadsides in the U.S. and southern Canada. Males sport iridescent copper-and-gold plumage, a red face, and a crisp white collar; their rooster-like crowing can be heard from up to a mile away. The brown females blend in with their field habitat. 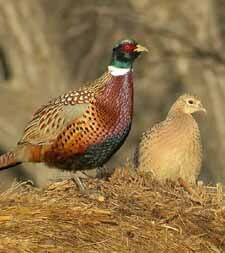 Introduced to the U.S. from Asia in the 1880s, pheasants quickly became one of North America’s most popular upland game birds. Watch for them along roads or bursting into flight from brushy cover.